Photo: The IOC (International Olympic Committee) Executive Board wrapped up its two-day meeting and met with the Olympic Summer and Winter International Federations in Quebec City, Canada. May 24, 2012. Photo © IOC/Renaud PHILIPPE. 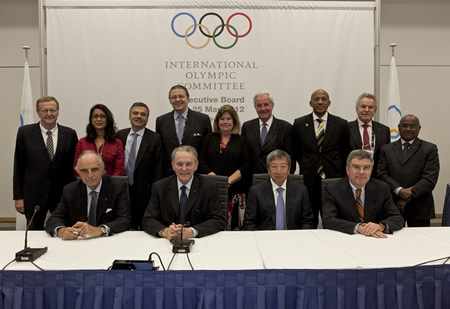 Photo: IOC and USOC (United States Olympic Committee) sign important financial accord. 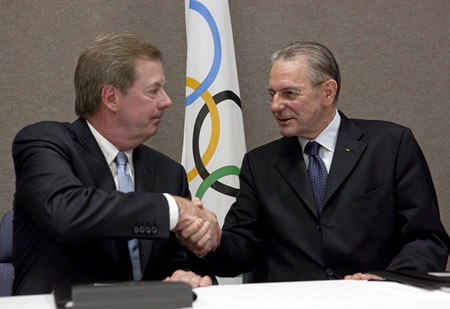 (L. to R.) USOC President Larry Probst - IOC President Jacques Rogge. Photo © IOC/Renaud PHILIPPE. 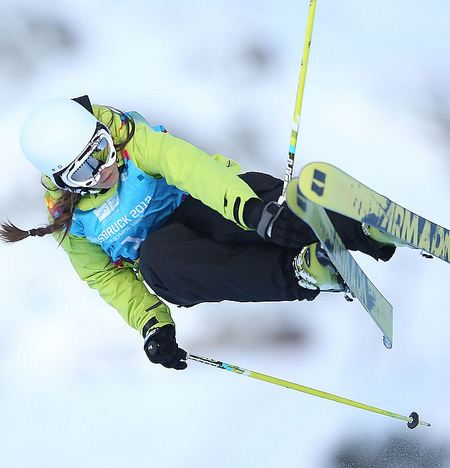 Photo: Marine Tripier Mondancin of France competes at Kuhtai during the Freestlye Ski Ladies’ Ski Halfpipe final of the Innsbruck 2012 Winter Youth Olympic Games in Innsbruck, Austria, January 15, 2012. Photo © Liao Yujie/Xinhua/IOC. 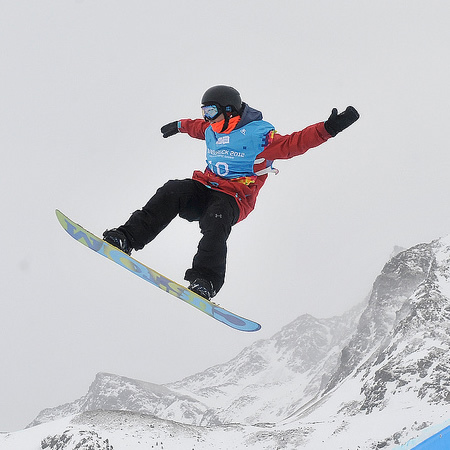 Photo: Michael Ciccarelli from Canada competes during men’s slopestyle snowboard of Innsbruck 2012 Winter Youth Olympic Games in Innsbruck, Austria, January 19, 2012. 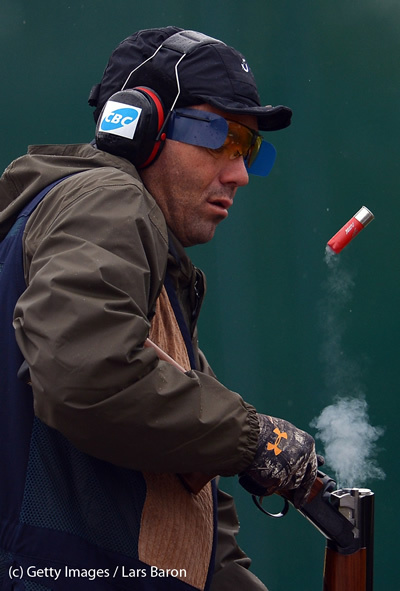 Michael Ciccarelli won the gold medal. Photo © Wu Wei/Xinhua/IOC. Photo: Model Karolina Kurkova arrives at the exclusive Filmmakers Dinner during the Cannes International Film Festival hosted by Swiss watch manufacturer IWC Schaffhausen in partnership with Finch’s Quarterly Review at the famous Hotel du Cap-Eden-Roc on May 21, 2012 in Cap d’Antibes, France. (Photo by Andreas Rentz/Getty Images for IWC. © 2012 Getty Images). 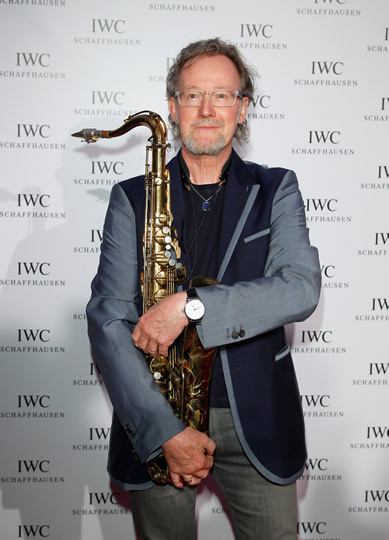 Photo: Musician John Helliwell arrives at the exclusive Filmmakers Dinner during the Cannes International Film Festival hosted by Swiss watch manufacturer IWC Schaffhausen in partnership with Finch’s Quarterly Review at the famous Hotel du Cap-Eden-Roc on May 21, 2012 in Cap d’Antibes, France. (Photo by Andreas Rentz/Getty Images for IWC. © 2012 Getty Images). Photo: Charlotte Casiraghi attends the Once Upon A Time Premiere during the 65th Annual Cannes Film Festival at Palais des Festivals on May 18, 2012 in Cannes, France. Charlotte Casiraghi is wearing Cartier jewelry (Photo by Andreas Rentz/Getty Images for Paramount. © 2012 Getty Images). Photo: 2012 Cannes Film Festival. May 17, 2012. Freida Pinto steps out of Renault Latitude, official car of the festival. Photo Credit: S. Kossmann. Photo: Bonnie Wright arrives at the exclusive Filmmakers Dinner during the Cannes International Film Festival hosted by Swiss watch manufacturer IWC Schaffhausen in partnership with Finch’s Quarterly Review at the famous Hotel du Cap-Eden-Roc on May 21, 2012 in Cap d’Antibes, France. (Photo by Andreas Rentz/Getty Images for IWC. © 2012 Getty Images). Photo: Actor Mads Mikkelsen and his wife Hanne Jacobsen arrive at the exclusive Filmmakers Dinner during the Cannes International Film Festival hosted by Swiss watch manufacturer IWC Schaffhausen in partnership with Finch’s Quarterly Review at the famous Hotel du Cap-Eden-Roc on May 21, 2012 in Cap d’Antibes, France. (Photo by Pascal Le Segretain/Getty Images for IWC. © 2012 Getty Images).